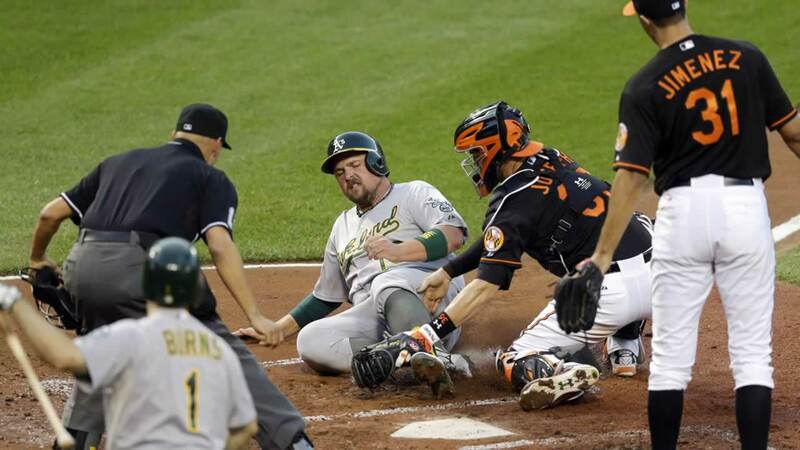 BALTIMORE -- Manny Machado hit a two-run homer in the 13th inning, and the Baltimore Orioles also got home runs from Adam Jones and Chris Davis in an 8-6 victory over the Oakland Athletics on Friday night. Caleb Joseph doubled with one out in the 13th against Drew Pomeranz (4-5), who left after being visited on the mound by the team trainer. Aaron Brooks entered, and Machado sent the right-hander's second pitch into the seats in left field. That enabled the Orioles to avoid a third straight defeat, which would have dropped them to .500 for the first time since July 27. The defending AL East champions are in third place in the division and 1 1/2 games off the pace in the wild-card hunt. Rookie Jason Garcia (1-0) got three straight outs in the 13th to earn his first major league win.